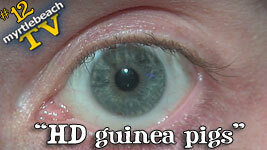 We introduced a new segment, HD guinea pigs, which shows some scary close-ups of the cast and guests, including Baghead dot com from Tequila Mockingbird's Mad Hatter Party. The local musicians segment of Episode 12 of myrtle beach TV takes viewers back to The Clubhouse in Myrtle Beach for an interview with SAVAS, one of the top bands in our area, who've enjoyed several real successes on a national level. Unfortunately, only the interview with the band is aired, since the sound system was blown during that evening's performance. We will be recording them again and catching their infective, unique music for a future episode. We also headed over to The Venue, known for years (under different ownership) as Cowboy's Nightlife, on Highway 17 in North Myrtle Beach, where we interviewed and taped an excellent local rock band, the Sick Stooges. These six musicians play hard rock classics from the 60s, 70s, 80s, and some 90s. And, once again, we had a great lunch at Bummz Beach Cafe in Myrtle Beach. After we finished eating and our lunch companions left, we starting chatting with locals at the tables around us. This is how we met a local comedian-magician, Carl Michael, who we interviewed and then watched as he performed two magic tricks for us and the other diners. The producers decided to catch some hi-def footage of the current stages of construction at Myrtle Beach Common, the redevelopment of the former airforce base on the south end. Warren, a ham operator for many years, and Marcia Lynn recently joined the Grand Strand Amateur Radio Club, and Warren attended his first meeting, where he interviewed a couple of members to learn more about the club and its important functions within the Grand Strand community. The Tech Notes segment took viewers inside Fire Fox, (the nickname of myrtle beach TV's production truck -- after a brake caliper caught fire and was flaming as we pulled into Hot Fish Club to tape 10 Toes Up) explaining the differences and pluses of using the FireFox browser. And, we attended an annual crafts fair hosted by the homeowners at Brunswick Plantation, who spoke with us about why they liked living in this friendly, beautiful community on the north end of the Grand Strand. Watch episode 12 online now.